This name uses Spanish naming customs: the first or paternal family name is Griñán and the second or maternal family name is Martínez. José Antonio Griñán Martínez (born 7 June 1946) is a Spanish politician. He is the chairman of the centre-left Spanish Socialist Workers' Party (PSOE), and from 23 April 2009 until 7 September 2013 he held the position of President of the Regional Government of Andalusia. 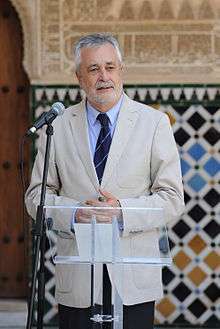 He replaced Manuel Chaves when Chaves was named Third Vice President of the Government of Spain in charge of Territorial Policy. In 2013 he announced his intention of stepping down and was subsequently replaced by the then regional Minister of the Presidency Susana Díaz. Born in Madrid in 1946, his family moved to Andalusia. He graduated in Law at the University of Seville, and started a public service career, finishing with the third best result on the 1969 competitive examination for the position of junior labour inspector, his first assignment was in 1970 in Zaragoza and he finally established in 1974, in Seville. He joined the PSOE at the beginning of the 1980s, and after the socialist victory in the Andalusian parliamentary elections of May 23, 1982 (the first such elections to be held, since the Spanish transition to democracy), served as vice minister of Labour in the Andalusian governments presided over by Rafael Escuredo and José Rodríguez de la Borbolla, until in 1986 when he was named vice minister of Health. In 1987 he was named technical secretary general of the Andalusian Labour Ministry and in 1990 was named as minister of health in the first government of Manuel Chaves. He served three terms as a deputy for Cordoba at the Congress of Deputies. First elected in the 1993 Spanish General election, he was reelected in 1996 and 2000. There, he served as twice as a minister during the Felipe González premiership: from 1992 to 1993 as minister of health and consumption and from 1993 to 1996 as ministry labour and social affairs. By March 2004 he served instead as deputy for Córdoba in the Parliament of Andalusia. In April 2004, Manuel Chaves named him minister of economy and finance, and later, in 2008, he was given the additional role of second vice president of Andalusia . On 5 April 2009, after the naming of Chaves as their vice president of Spain, his name was announced as the most likely successor Chaves at the Presidency of Andalusia, and eight days later the Regional Committee of the PSOE-A (the Andalusian federation of PSOE) officially proclaimed his candidature. On 22 April 2009 Griñán was voted in as President of Andalusia by the Andalusian parliament, with 56 votes in favor (PSOE) and 53 against (PP and IU). He took office on 23 April. Three former Andalusian presidents attended the ceremony—Rafael Escuredo, José Rodríguez de la Borbolla and Manuel Chaves—together with the President of Castile-La Mancha, José María Barreda; the Secretary of State for Immigration, Consuelo Rumí; and the President of the High Court of Andalusia, Augusto Méndez de Lugo. In the 2012 regional election his party, PSOE, lost the absolute majority in the Parliament getting only 47 seats out of 109. Griñán had to make an agreement with United Left to secure a majority coalition government and keep his position as the President of Andalusia. In the terms of this agreement, the leader of United Left, Diego Valderas, became the Vice-President of Andalusia. On 26 June 2013 he announced he would not seek reelection. His party entered in a substitute election process won by Susana Díaz. On 27 August Griñán announced he was stepping down. On 7 September Díaz took the chair. Then he entered the Senate as senator autonomy elected by the Parliament of Andalusia. On June 15, 2015 leave his seat as senator autonomy after charging in the corruption scandal named case of ERE. Griñán is a recipient of the Grand Cross of the Order of Charles III, which gives him the honorific of Excelentísimo Señor. 1 2 Real DECRETO 711/2009, de 22 de abril, por el que se nombra Presidente de la Junta de Andalucía a don José Antonio Griñán Martínez, BOJA 2009/77, 23 April 2009. Retrieved 22 December 2009. ↑ José Antonio Griñán sustituiría a Manuel Chaves en la Presidencia de la Junta de Andalucía, Europa Press, 5 April 2009. Retrieved 22 December 2009. Wikimedia Commons has media related to José Antonio Griñán.